UPDATE: Our filtration system has been upgraded since this post. Click here to read about the new Single High-Powered UV Filtration System that comes with every Float Tent purchase. 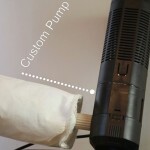 The first part of our design is a custom submersible pump with UV filter (black piece). This piece draws the water in and runs it under an actual UV light that kills the bacteria. If you want to read up more on this process click here. Once the water is sterilized under the UV light it’s pumped out through the filter, that’s the cream piece on the left. This picture shows the filter connected directly to the pump, but in the actual tank we send the water down a hose to the other end of the tank where it then goes out the filter. We designed it like this so that water is drawn in on one end of the tank and exits on the other. This creates a natural circulation so all of the water is cleaned instead of just one area in the tank. The tank holds about 240 gallons of water and our pump cleans about 26 gallons per hour. SO, your water will be totally cycled and cleaned about once every 8 hours. Pretty sweet considering the system is always on when you’re not floating. Almost 3 full water cycles of cleaning every day. 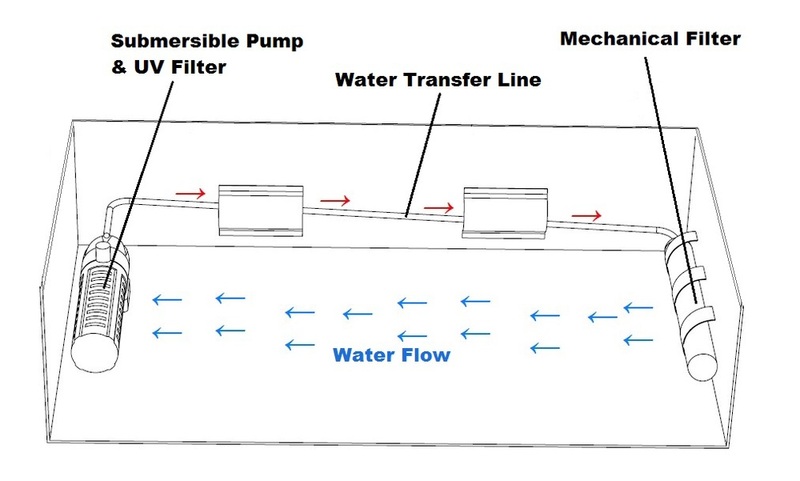 Check out this technical drawing of the filtration system. The water enters at one end of the tank in the submersible UV Filter/Pump. The water is sent down a hose to the other end of the tank where it exits through the filter. The filter is actually on the end of the tank with the door so each month or so when you clean the filter you just lean in, disconnect the filter, wash it, and reconnect. It’s that easy. Trust me… low maintenance is the key to good home floating.